If you usually visit some blogs or forums, you can easily discover that, with the increasing development of the society, more and more advanced technologies have stepped into people's life. However, at the same time, many serious disk problems have come into being as well. The questions, such as "how do I format my hard drive" "how to solve the "low disk space" problem" can be frequently heard now and then. Then, a countermeasure to "format hard drive" will be introduced to all the users. As we all know, the Windows built-in Disk Manager does possess several functions to deal with disk troubles, for instance, create, format, delete volume, etc. However, there are invariably some existing limitations as well. As a formatting tool, the Windows disk manager has some drawbacks listed below. The system drive can not be formatted. The drive that has the "Pagefile.sys" file can not be formatted. If the drive is lager than 32GB, Windows disk manager can not format it back to FAT32. As for the second situation, the task can be accomplished by removing the "Pagefile.sys" file to another drive. Tips: Pagefile.sys is the Windows virtual memory swap file to store frames of memory. The steps: "my computer"->"properties"-> "Advanced system settings"-> "set"-> "Advanced"-> click "Change" under "Virtual Memory". 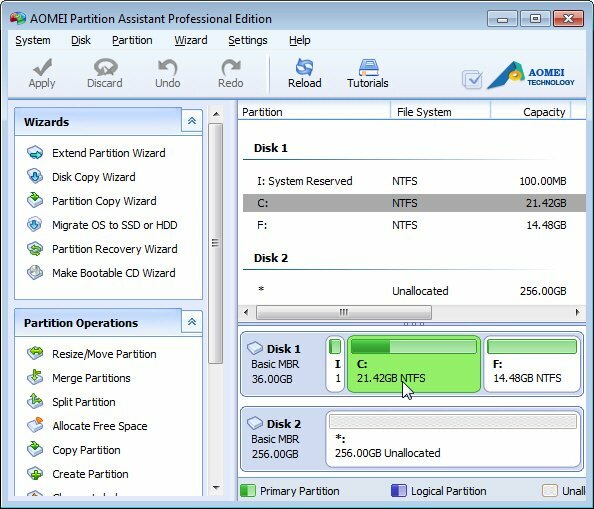 As for the last one, a third party program, AOMEI Partition Assistant will be strongly recommended for the users. Because it can format the partition that is lager than 32GB back to FAT32 up to 2048GB. What's more, it possesses many other advanced partition functions as well. It can help to solve the "low disk space" problem mentioned before, as well as many other common disk troubles. Therefore, if you are still worrying bout these disk problems, just download the software and resolve them at once.